The picture on the right of the Hong Kong Orchid Tree was taken in March. Its flowers are an impressive six inches across and vary in color from burgundy to purple. The flowers have a very faint sweet scent. The leaves on this tree have an interesting double lobbed shape. This orchid tree was planted in October 4 years ago and is in full sun. Orchid trees do very well in the lower desert heat but have troubles with the saltiness of the Phoenix area water. Not all varieties of orchid trees are created equal. 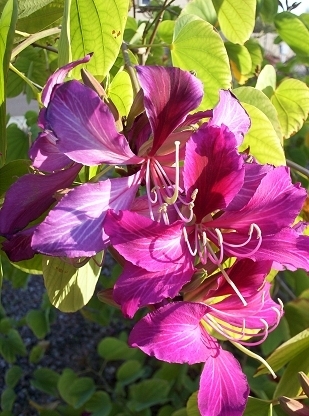 The less common Hong Kong orchid tree is preferable to the more common Purple orchid tree. Most importantly, the Hong Kong is sterile so it does not produce the messy beans that the Purple does. Also, the Hong Kong has larger flowers and leaves, and a longer flowering period, from January to May. The Hong Kong also has a white smooth trunk rather than the rough black trunk that the Purple has. Orchid trees can become very large, up to 30 feet tall, but can also be kept as a small tree or bush with pruning. Orchid trees do very well in the lower desert heat and sun if they have sufficient water. Hong Kong Orchid trees are damaged at 27 degrees Fahrenheit. Their leaves, flowers, and small twigs will be killed back at this temperature. However, their larger limbs are a couple of degrees more hardy. Also, they will come back from their roots unless the ground freezes, which never happens in the Arizona desert. Orchid trees do well on a grass watering schedule. Orchid trees grow vigorously without fertilization, and burn easily, so it is best not to fertilize them at all. They go semi-dormant in early summer, and look ragged during this time. Just continue to water the tree as normal and it will start to put out new growth in late July. Hong Kong orchid trees are propagated vegetatively while Purple orchid trees are propagated from seeds. Orchid trees have no significant pests in Arizona.